In this tutorial I finish covering the GRASP patterns I covered previously here GRASP Tutorial. This time talk about Polymorphism, Indirection and Protected Variations. They show how you can create flexibility in your system in different ways by having different classes implement interfaces. I also talk about Pure Fabrication, which shows the importance of separating out code that impedes low coupling. Code follows the video to help you. Thank you so much for these tutorials. I am in the process of improving my skills and these videos just make everything easier to understand. Thank you. These are awesome tutorial. You think you can do more of these? Thank you 🙂 When I start making Android Games I’m going to model them out like this first and then make the games from the models. 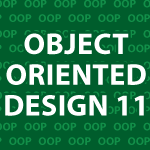 I didn’t do that in the past because I can never trust that people saw the Object Oriented Design tutorials first. That is one of the flaws with online education. I can’t control which videos people watch first.